When I started practicing mindfulness I quickly realised that some people are more naturally mindful than others. Both my husband and my daughter, regardless of their age, are, in my opinion naturally mindful. They have both taught me alot in expressing gratitude, being present and being attentive listeners. They don't tend to dwell in the past or worry about things that may or may not happen they just focus on the now...what's happening at presnt in their lives. mindfulness-based practices can help children calm down, become more focused, fall asleep more easily, alleviate worry, manage anger, and generally become more patient and aware. I've always loved reading stories to both of my children and introduced them both to books at a very young age. Being a designer I have always been attracted to books that are beautifully designed and illustrated and got great enjoyment browsing through the children's books in every book shop. The many benefits of reading to you child are endless and we all know them but how often do we read the story from start to finish while being totally present? There were often those evenings when they were very young when I was so tired that I might have tried to skip a page without them knowing it. Or those evenings when I had a list of things to do that you just needed to get to the end quickly so that they would fall asleep. I don't think I'm alone when I say it's happened to us all at some stage! What I've discovered since practicing mindfulness is when you are completely present in the story as you read it you will not alone be spending quality time with your child - you will also be experiencing looking at things in childlike wonder and you might really enjoy the story as it unfolds - even if you've read it 20 times before! Every year for the last few years I have been saying the same thing "We should go to Bloom" but somehow for one reason or another we never went. Mainly because for a number of those years we had a mobile home in Liscannor so every June Bank holiday weekend when the Bloom Festival was on we were down there. This year as we are in the process of redesigning our garden we said "OK...no more excuses!". Then just when we thought "yay! I'm finally going to Bloom!" my poor little son got sick with a chest infection. I just thought okay, I'm going to be mindful about this as this is out of my control and there's nothing we can do about it - we'll aim for next year! The funny thing was the one who was most disappointed about us not going was my son! After lots of couch cuddles on saturday and sunday he had a good nights sleep on the sunday night and was much brighter on the monday so after much deliberating - and major convincing from him we decided to head off. It was a late start for us (due to the deliberating and temperature checking) but again in the past I probably would have thought - it's too late it will be lunchtime before we get there. I thought - we'll be there by lunchtime so we'll have the full afternoon! As predicted, we got there by 1pm. After driving from Limerick we parked our car at the Red Cow Inn and got the Luas into Hueston Station where there were free shuttle buses going to and from the Phoenix Park where Bloom was on so it was stress free as we avoided the traffic and having to find parking. Checking out the Cully and Sully Food Lab in the rain! On arrival I was very impressed with Bloom’s new ‘kids passport’ initiative, which gave my 6 year old son a wristband with a contact mobile phone number printed on it so that if he was to get separated from us in the crowd that we could be easily re-united. He's not one for wondering off but he was still happy out with his wristband! My daughter now having her own mobile phone was less impressed. As we arrived at lunchtime, we went straight for food and to say we couldn't have been in a better place was an understatement! We were surrounded by Ireland’s top food and beverage producers with the best of fresh food, artisan and organic produce, meat, poultry and fish and ‘Best in Season’ fruit and vegetables. We spotted two familiar places - Adare Farm and Country Choice (which we frequently visit in Limerick's Milk Market on a Saturday) - but these both had the longest ques - and with the beautiful aromatic smells wafting from both of them and knowing how their food tastes I'm not one bit surprised. The most popular items from the Country Choice stand appeared to be their iconic flash fried sirloin of Hereford with sweet carmalized onions, Country Choice honey and mustard salsa, mature Cashel blue, roast peppers and local Organic leaves all on a warm Ciabiatta. While Adare Farm had their roast suckling pork that would melt in your mouth with every bite. There was also the Bloom Bistro that offered a more formal sit-down meal, or an informal café and seafood-bar which unfortunately we only discovered later that day. We were handed maps on our way in but I did think that the food options on this weren't explained very well and could have been clearer visually - and that's not the designer in me speaking as my husband agreed! After we had sampled the food and we felt content with our full bellies we headed off to explore the gardens. The visual display of flowers, plants and trees here didn't disappoint and to see what some of the garden designers had created with their spaces was beautiful. We also managed to pause as much as possible to smell all the gorgeous roses and saw lots of bees To top it off there was even a Dispicable Me Garden with 2 Minions that made my son's day! After we had visited the gardens the rain unfortunately started to fall so we didn't get to spend as much time in the kids area as we would have liked but did get to check out strawberries and bluberries growing in the Keelings stand and my daughter also got to watch a visual tour of the Keelings farm which she enjoyed but to my son's dismay was over 12's. After my son got to sample some Innocent Smoothies we made our way back to the food stalls to purchase some produce and at this point there were lots of bargains on offer as the weekend was coming to an end so we stocked up on pestos, cold meats and even hand-made chololate and gourmet marsh mallows by Mallow Mia! All in all this family day out was definitely worth a trip and something that we finally got to experience. After all the years of saying "We must definitely go to Bloom" I can now finally say "I'm glad we experienced Bloom"! 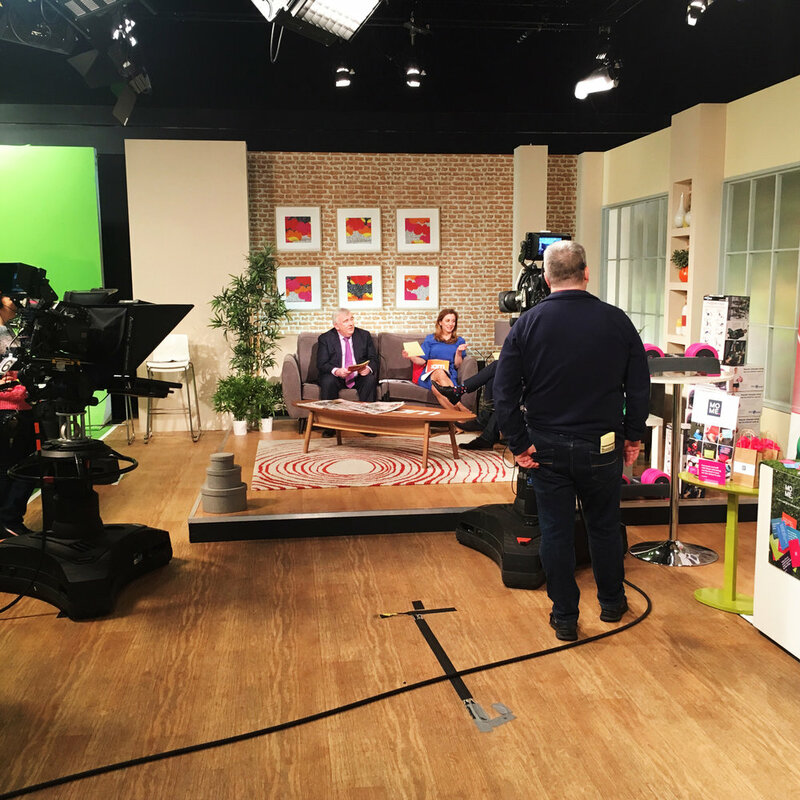 When I was contacted by one of the lovely researchers at TV3 to appear on their Boost My Business section of Ireland AM, I was excited about the opportunity but also very scared at the thoughts of appearing on live TV! Television was something I had never done - I was comfortable sitting in front of a computer screen but it was a first for me appearing on national television and the fact that it was going to be live - yes LIVE!!! - would normally have only added to my anxiety if I had allowed it to! After running my own design agency for almost 2 decades, I had done many presentations to clients but since I developed tinnitus I struggled a bit with these until I started meditating. So while I was getting back on track meeting clients and presenting my designs, being on television was another kettle-of-fish! I firmly believe that being mindful about the upcoming appearance really helped how I felt about it. I also had my daughters confirmation on the friday previous so that was a welcomed distraction as I said to myself "I won't think about it until after the confirmation" and that's exactly what happened - it didn't enter my head from that initial call from TV3 until the Sunday before my appearance. On the journey up to Dublin that morning at 6am, apart from doing my make-up followed by a 10 minute meditation and chatting to my ever supportive husband, I decided to use my MoMe Cards to flick through. I shuffled them around a bit and it's funny as the one card that kept coming up was "Inhale, Exhale, that's how you'll get through it". I joked about it with my husband a bit but I can honestly say it helped me breathe and forget about the cameras and the fact that it was going to be live and just relax about the whole experience. When we arrived at TV3 everyone there were so welcoming. I initially felt at ease - still a bit nervous - but definitely not anxious like I would have been in the past. I realise 100% that as we get older, age definitely helps us deal with situations like this, but without a doubt I know that mindfulness and meditation helped me breathe and relax in a situation that in the past I would have worked myself up into a tizzy over! Behind the scenes getting ready for my first live tv appearance and remembering to Breathe!! It's a wrap! Such a lovely experience with all the Ireland AM team! Meeting Alan Hughes and below with the lovely Sinéad Desmond who was an absolute pleasure to meet! We didn't have long to get set up as obviously everything on Live TV happens so quickly - but again - that was probably a good thing! I got the chance to have a quick chat with the really lovely Sinéad Desmond, but after Mark Cagney introduced himself to us it was time to go live! Even though there was no time for a run-through and have a chat about what questions we would be asked, Mark made everyone feel at ease. He was a complete gentleman and even noticed how I was using my cards to help me breathe! So, along with listening to my breath and not my tinnitus ringing loudly, and focusing on what Mark was asking me and not the cameras - I ended up really enjoying the experience in that moment so it was all over before I knew it! After we wrapped up everyone was so lovely. I got to have another chat with Sinéad Desmond - who was so friendly and approachable - and so genuine! It really was such a lovely experience and one that I am very grateful to the team at Ireland AM and TV3 for. I received such fantastic feedback from family and friends after the appearance and it also proved to be a great way of boosting a little business that ironically never ever set out as one! Thank you TV3!